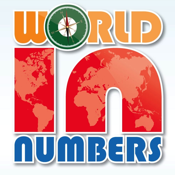 World in Numbers takes you on an exciting trip through five continents of the world (Asia, Africa, Europe, Americas and Australia), but this trip is not like any trip you've taken before. - Test your eyes sharpness and abilities in matching between numbers. - Find out how it will do when you are playing against time. - Put your memory to the ultimate test. - Test your abilities in solving mathematical formulas. - Play against your own device and find out how you will do against it. 19 different achievements are waiting for you to collect them, if you believe you are good enough enjoy our trophies and be proud of your brain. You can also challenge your friends via Bluetooth. We believe our new brain teasing game concept will give you the brain stimulation you have ever had. Don’t forget to check out your brain ranking on Earth from Game Center.